The USFMEP was delighted to take part in a Council on Foreign Relations panel titled "Climate Change Migration Beyond Paris." 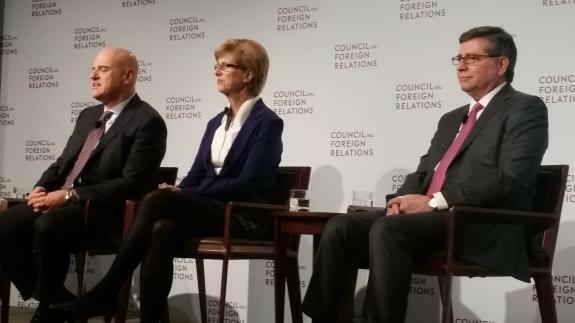 This panel included Claudio Desclazi, the CEO of Eni, Daniel M. Price, the Managing Director of Rock Creek Global Advisors, Christine Todd Whitman, the Former Governor of New Jersey and the President of the Whitman Strategy Group and Michael A. Levi, the David M. Rubenstein Senior Fellow for Energy and Environment at the Council on Foreign Relations. The event featured a valuable discussion on the various global efforts to combat the issues of climate change. USFMEP supports any efforts to assure sustainable development and peace for generations to come, and such panels are very significant for creating a better world.